Advocacy, retraining and self-help were Mrs Vasey’s core goals in establishing the Guild. The NSW Guild commenced on 4 June 1946. Since then, the Guild’s advocacy has been rigorous and persistent, resulting in many benefits being available to war widows. 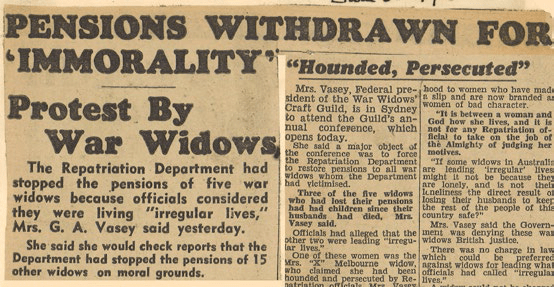 In the late 1940s and 1950s the Guild’s main advocacy drive was around pension entitlements, ensuring war widows did not have their pension withdrawn. We have read stories of war widows who had been ‘hounded and persecuted’ and had their pension withdrawn for immorality. In typical blunt, direct style, Jessie Vasey has been quoted as declaring “I don’t care if she sleeps with ten men a night” (No Mean Destiny). Government’s bureaucracy meant fighting for the pension to equal the minimum wage was “a constant battle… It depends on us to be the guardians of our own rights and guardians of our children’s rights” (Second Annual Report 1949 and ninth annual public meeting 1956) and fight for an increase. There was no holding back by Jessie Vasey, an untiring battler for the widow’s rights; so passionate, that she wrote to the editor of The Duckboard: If I were Minister for Repatriation…I would not be Minister for long…” (see image). Into the 1960s local council rates and transport concessions were the lobbying flavour of the decade for the Guild. During the 1970s the pensioner medical services card and access to medical care were at the forefront of the Guild’s fight and it was supported by the Toose Report, an independent non-parliamentary enquiry into the Repatriation System. The Guild constantly monitored and advocated for war widows’ benefits – nursing home fees, monitoring to change from Repatriation Commission to Department of Veterans’ Affairs, ensuring war widows’ needs are not lost. The struggle was stepped up in the 1980s for more concessions – travel and free transport. The Guild was clever at rallying the membership to write to respective members of Parliament such that Barrie Unsworth begged of Una Boyce, “could you tell them (members) to stop writing now?” with a smiling reply from Una Boyce “not until we get the concession”… so what could a politician do but concede defeat? As a result, in 1985 free travel on public transport was heralded in with great aplomb in the same way that car registration and driver’s licence fees did five years later. Changes to the Veterans’ Entitlement Act (removal of the limited period for pensions and continuation of entitlements for remarried war widows) were also a result of the Guild’s untiring efforts and campaigning. The Guild maintained vigilance with many government departments to ensure benefits were maintained – Home Help Scheme was withdrawn and later restored. Integration of Concord and Lady Davidson into the public health system was watched closely in the 1990s. At the same time, the introduction of the new tax system (GST), as well as concessions for motor vehicles, rates and taxes, was on the radar. The Guild continued to ‘watch over and protect the interests of all war widows’. The new century saw remarried war widows in the limelight again, with those who lost their pension when they remarried, having their pension reinstated in 2002. The Clarke Review had notable success by unfreezing the ISS payment which had been unchanged since 1986. The Guild worked with other stakeholders to successfully lobby for free Photo ID cards for war widows and pensioners, requiring changes to legislation and overcoming resistance. The Guild watched closely the changes to legislation – the Military Rehabilitation and Compensation Scheme (MRCS) replaced the Veterans’ Entitlement Act (VEA) and the Guild monitored the potential impact on war widows. Other causes wormed their way through the big issues – transport concessions, taxi schemes, bus services, rent assistance, seniors’ allowance. In 2004, $25,000 was awarded to ex-Japanese prisoners of war or their war widows. However, this legacy resounded through the ex-service community resulting in the payment being granted to all prisoners of war through persistence from the Guild, who banded together with other ex-service organisations to make a stand. Over the last decade, the Guild has not waned in its advocacy for war widows: the Do Not Call Register, older driver licensing issues, access cards, council and water rates, breast screening, mobility parking, review of Productivity Commission, vehicle registration, taxis and the pensioner concession card to all war widows. Then there are the big issues requiring advocacy by the Guild at State and National level – MRCA review, Aged Care Act, Elder Abuse Project, ASIC/ ACNC changes (or abolition), and ensuring our WWI war widows were well represented at the Gallipoli ANZAC Centenary services. More recently, submissions to Community Home Support Program, DVA Homefront, TCI card, and more push for the council rates and concessions issue. Persistence generally has paid off…”nagging is a very good weapon for a woman” (Eleventh Annual Meeting 1958) and has provided a certain degree of success for the Guild and its drive as an advocate for all war widows; even monitoring DVA’s language in letters to war widows for clear understanding. As the need arises, advocacy is undertaken by Guild office bearers and senior staff through representation on committees and consultative forums and by liaising with appropriate government agencies and other organisations. The Guild continues to ‘watch over and protect the interests of all war widows’. In 2002, the unfreezing of the Income Support Payment for War Widows, in conjunction with Legacy. The ISS had not been increased for 16 years, resulting in a major erosion of war widows’ pensions. In the 2000s, the Guild worked with the Department of Veteran Affairs (DVA) to improve the Veterans Home Care program. Successfully working with other organisations to achieve the introduction of a Photo ID card for those who did not have drivers’ licenses or passports. After many years of lobbying, car registration concessions were extended to all war widows. Advocating and achieving the establishment in March 2010 of the Widows’ page in DVA’s newspaper, Vetaffairs, and providing content since then. This ensures there are articles and information of interest to war widows in the newspaper. The Guild has over the years been represented on a range of forums and committees, including the NSW Ex-Service Round Table on Aged Care, the DVA National EX Service Round Table on Aged Care, national DVA meetings and forums regarding contemporary widows, examining their support needs. The NSW President is represented on the current NSW consultative committee – the Deputy Commissioner’s NSW Consultation Forum. The Guild is represented by the National Guild President on DVA’s Consultation Forum, the Ex-service Round Table (ESORT). The Guild also worked over a sustained period with DVA and major taxi companies to improve taxi services for veterans and war widows. Individual representations on a range of matters are made on behalf of war widows to all levels of government, with significant achievements on a range of matters, including assisting war widows with overpayments from DVA, and with problems with obtaining appropriate health assistance. Achievement, after many years of advocacy, in having DVA BEST grants extended to organisations like the Guild conducting welfare, resulting in significant grants being received by the Guild over recent years. The Guild has also advocated for grants to be able to undertake commemorative and other events for war widows. This included encouraging DVA to recognise that women should also be involved in such commemorative events, and able to access available grants. In 2016, the Guild and the Partners of Veterans’ Association of Australia were successful in obtaining a grant to hold an acclaimed major commemoration to mark the Vietnam Conflict at the ANZAC Memorial Hyde Park. The Guild has worked on a number of collaborative projects including an osteoporosis project with Concord Repatriation General Hospital, and a project with the NSW Taxi Council to improve taxi services. supporting the introduction of the Friendship Line through its establishment as a service to war widows and the development of strategies to build Friendship Line numbers since 2000 to the present into a significant continuing service valued by our members. The provision of more support and services for members by building up the welfare and friendship services of the Guild. The increase from 40 Guild Clubs and one Social Club in 2000 to a peak of 105 Clubs all around NSW, and thus provided significantly more access to Clubs for members especially in regional areas. The writing of the history of the War Widows’ Guild of Australia NSW Ltd, No Peacetime Cinderellas, which outlines the significant work of the Guild over its first 60 years. I often sing the praises of what War Widows have been able to gain for us over the years for I have been a member of perhaps over 30 years.